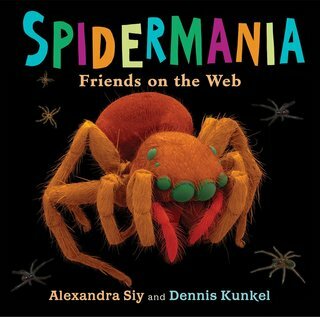 Spidermania: Friends on the Web debunks myths about spiders and takes an extremely close look at creatures that have both fascinated and terrified humans. An introduction explains what makes spiders unique. 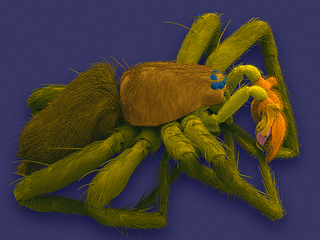 Then ten species are highlighted with incredible electron micrograph images and surprising facts. From diving bell spiders that live in bubbles underwater, to spitting spiders that shoot sticky streams of spit at their prey, to black widows and wolf spiders, this unusual book will intrigue readers and help cure arachnophobia. A companion title to BUG SHOTS. NEW large format paper book includes larger than life photos of the superheroes of the animal kingdom! Learn why spiders are some of the most amazing animals on the planet and how scientists study them. This is "Devon's Spider!" Read about about how it was identified in UP CLOSE WITH SPIDERS. Featuring abundant boldly colored visuals and a wealth of information, Siy and Kunkel (Bug Shots, 2011) offer a lively introduction to spiders. The book first covers general characteristics and behaviors, from their physical makeup to how they create silk. Then they go on to discuss 10 spider types, such as black widows, tarantulas, and orb-weavers, as well as the diving bell spiders, which live underwater. Siy's clearly written text then addresses spiders' unique aspects, typical life cycles, and whether they're poisonous to humans. Siy conveys scientific concepts and terminology very well, and her text is nicely complemented by Kunkel's detailed, vivid photographs and digitally enhanced electron micrographs, all of which are accompanied by descriptive captions. Though some squeamish or bugphobic folks might balk at the large photos (and shudder to learn about common household hiding spaces for spiders), readers will come away with a fairly comprehensive understanding of spiders and spider diversity. The extensive back matter includes the typical elements as well as a guide for recognizing and identifying particular spiders by eye pattern.